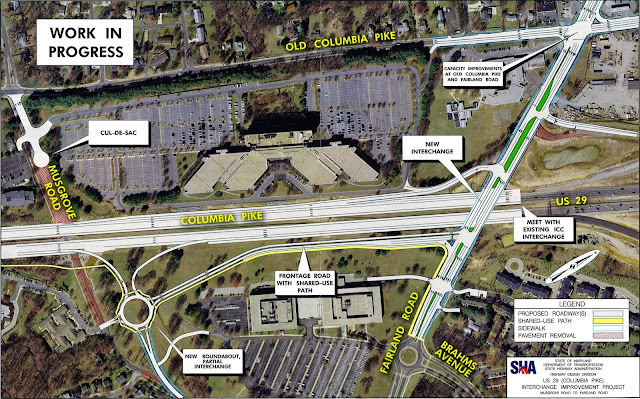 Maryland highway planners say four new interchanges on Route 29 in eastern Montgomery County will cut congestion, improve pedestrian and bicycle safety, and make it easier to build bus rapid transit. But the designs they've proposed would actually make all three of those things worse. One of four proposed interchanges along Route 29 in Montgomery County, with north on the right side. Image from the Maryland State Highway Administration. For decades, Maryland highway planners have been trying to turn Route 29 between New Hampshire Avenue in Montgomery County and I-70 in Howard County into a freeway. They recently unveiled new designs for a $128 million interchange at Route 29 and Fairland and Musgrove roads, just south of the Intercounty Connector. 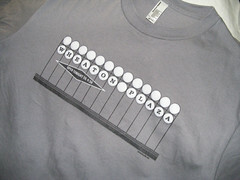 Today, both roads intersect Route 29, also known as Columbia Pike, at separate stoplights. Under the state's proposal, Musgrove Road would become a dead end street on the west side of Route 29, while on-ramps and off-ramps would connect the east side of 29 to its northbound lanes. Fairland Road would go from four lanes to six and only have access to 29 going south. If the project gets funding, construction could get underway in 2018. Maryland has already built interchanges along Route 29 in Howard County and in Montgomery County at Cherry Hill Road, Briggs Chaney Road, and Route 198. In 2002, plans to build four more interchanges at Fairland and Musgrove roads, Stewart Lane, Tech Road, and Greencastle Road were put on hold and the focus shifted to the Intercounty Connector. In 2013, then-Governor Martin O'Malley revived the projects. Better for pedestrians, bicyclists, and transit? Proponents of the Route 29 plan tout its benefits for people walking and riding bikes. They note that the plan includes a shared-use path along 29, new bike lanes on Fairland Road, and filled in sidewalk gaps on Musgrove Road. Meanwhile, acting Montgomery County DOT head Al Roshdieh says building the interchanges planned for the 29 corridor are necessary for the bus rapid transit line the county wants to put in there. But accommodating people on foot, bikes, and transit shouldn't be an excuse to build more highway interchanges that simply dump more cars on Maryland's roads. In fact, dumping more cars on the roads will only make traffic worse in the long term. The amount of driving on all of Montgomery County's state highways has remained steady for over 10 years even as the population has grown by 100,000 people. But even though Route 29 is one of those highways, its traffic has increased 10% since 2006. 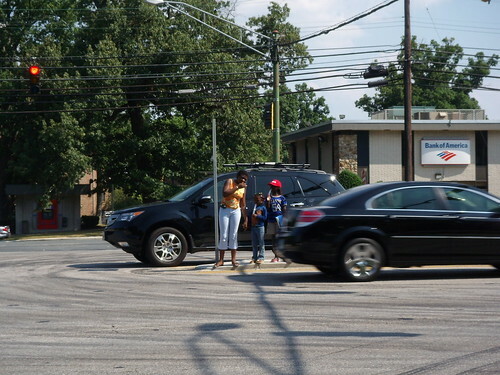 A family tries to cross Route 29 in White Oak. Photo by the author. Part of that is because of new development further north in Howard County, whose residents drive on 29 to jobs in Montgomery and DC. But it's also because of the three other interchanges that Route 29 gained over the last decade. Research shows that building more roads in an effort to cut congestion is actually counterproductive. The roads eventually just fill with more cars as drivers use the new road space to drive more or longer distances than they used to. Meanwhile, the interchange will create more congestion by taking away local connections. Today, drivers on Musgrove and Fairland can directly turn onto Route 29 to go either north or south. But with an interchange, everyone will have to go to Musgrove to go north on Route 29, or go to Fairland to head south, putting more traffic on both roads. Making Musgrove a dead-end on the west side of 29 also pushes more east-west trips onto Fairland or Cherry Hill Road. Another interchange will simply make it easier to speed down Route 29 from points north. But there isn't any room to widen Route 29 or build more interchanges further south, meaning drivers will end up at the same existing bottlenecks in Four Corners, downtown Silver Spring, and in the District. Speeding people through the area also undermines Montgomery County's efforts to create town centers in White Oak and Burtonsville. The bottom line is that if you want to reduce congestion on Route 29, you've got to get people out of their cars and on to something else. The current plan doesn't do that. So what's the alternative? 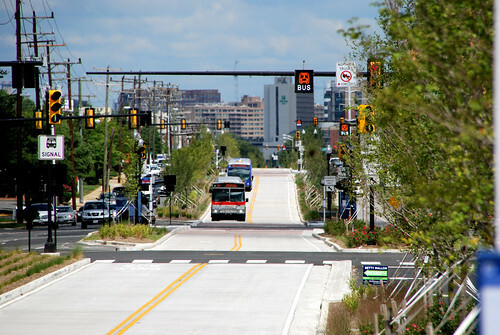 In Montgomery County's annual transportation priorities letter to state officials, county councilmembers ranked a bus rapid transit line on Route 29 as a higher priority than the interchanges on Route 29. This is a reversal from previous years. County planners estimate that a BRT line on 29 between Silver Spring and Burtonsville would cost just $351 million, compared to $472 million for the four new interchanges proposed on Route 29. BRT can be cheaper and way less disruptive than more interchanges. Photo by BeyondDC on Flickr. Not only is transit cheaper than turning Route 29 into a highway, it is easier to build and ultimately more effective. We can fit bus lanes in the median of Route 29 north of New Hampshire Avenue without building any more interchanges or widening cross streets. Transit gives drivers an alternative, meaning that car traffic along the corridor may grow much more slowly than it would otherwise. It allows both existing downtowns like Silver Spring and future town centers like White Oak to grow without putting as much pressure on already congested areas. We don't need interchanges to make it safer for pedestrians or bicyclists either. Filling in sidewalk and bike lane gaps, creating more crosswalks at stoplights, and reducing the speed limit along Route 29 can improve safety without spending nearly as much money. Maryland completed its environmental study for Route 29 in 1995. 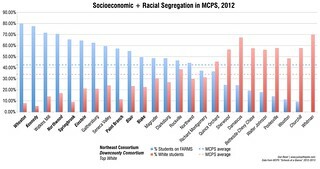 Since then, the communities along Route 29, and Montgomery County as a whole, have changed. County residents and companies alike want transit and walkable neighborhoods. Route 29 is now one of the region's busiest bus corridors. Meanwhile, East County neighborhoods are grappling with disinvestment as growth moves out to Howard County. Turning Route 29 into a freeway might have made sense 20 years ago, but now it's time to reconsider. There are better, cheaper, less disruptive ways to get people where they're going. This has been planned for MANY years. They started with the northern part of US 29 back in the 80s, and have slowly been working their way toward White Oak as the state has gotten funding to continue the project. ...by the way, did you notice that the Verizon building on the north side of the highway in the aerial photo looks like an old school telephone handset? I grew up off of Musgrove Road and lived there for 14 years, but I only noticed that recently! It's pretty clever. Too bad kids growing up today probably don't even know what phones used to look like! Neither BRT nor more interchanges is the solution to our road congestion problem. Both are20th Century solutions to our 21st Century problem. We could reduce congestion greatly by only marginally reducing traffic. The best way to do that isn't to force people to use inconvenient and expensive transit with likely multiple transfers to get to their destinations. Instead we need to reduce the need for people to commute. We can do that by building Gigabit to the home Internet in Montgomery County. With such a system people could work from home just as if they were in the office with multiple real-time video conferencing and information exchange. Move information, not people. Such a system would be much less expensive than BRT and would not require expensive operational subsidies year after year.